A-1 Rental is pleased to announce the arrival of some new equipment. Reach farther and dig deeper with this 324 compact excavator. Its 8 ft. 6 in. dig depth and 14 ft. reach deliver serious digging possibilities in tight areas, with minimal repositioning. Hydraulically retract the undercarriage to only 39 inches to travel through gates or between homes, and then expand to 54 inches for a wider footprint and greater performance. Equipped with the same hydraulic system as a larger Bobcat excavator, the 324 has impressive cycle times and break-out forces to complete jobs faster. The system's torque-limiting piston pump is able to sense and react to hydraulic loads, for better utilization of the engine's torque curve. 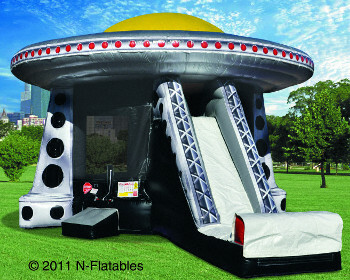 It's time for out-of-this-world fun with the this flying saucer shaped bouncer-slide combo. Size: 18’ x 26’ x 31’. Heavy-duty steel blade is a 0.25" thick and cuts through saplings up to 2.5" thick. Lock-in/lock-out differential provides the best in traction and handling. Pivoting deck follows the contours of the ground for a clean cut. Puncture-proof tires are filled with a liquid sealant. Gear-driven transmission features 4 forward speeds and reverse. Welded deck is much stronger than stamped steel decks. Custom-made blade spindle is integrated with the deck and supported to protect the blade shaft. Electric clutch engages the blade and is maintenance free (no cables to stretch or adjust). Driven by 4-stroke gas/petrol Honda engine. No need to mix fuel and oil, easy starting, low noise operation, low maintenance and reduced fuel consumption. Heavy-duty throttle control provides more reliable and longer service. Additional built-in air filtration system plus the original air cleaners in the engine provides cleaner air to engine for longer life and improved durability. Integrated fuel valve provides for easy starting. Heavy shock mount system to reduce hand-arm vibration and improve operator comfort. Plastic oil tank offers longer life and rust-free. Rammer shoe made of steel plate with wooden insert offers economical usage. Special protective frame on engine prevents possible damage on job site. Trolley kit for easy transportation. 5,000 watt version pictured for demonstration purposes. Dimensions(LxWxH): 27" x 21" x 22"